SSK carried almost every category of baseball uniforms and equipment by the end of 1950's. From early 1960, we have made every effort to listen to the advice of professional players for product development. Because of the fact that SSK mainly focused on "rubber" ball players for marketing in Japan from the 1950s to the late 1960's, serious "hard ball" players did not seriously consider our SSK baseball products. We then signed the late Minoru Murayama (Pitcher -Hanshin Tigers / Hall of Famer) as an advisory staff member to promote the SSK brand-a first in the Japanese sporting goods industry. On his retirement in 1971, Mr. Murayama was invited to become a senior advisor, with the task of aggressively developing the highest performance/quality products to satisfy the demands of the finest ball players. Thanks to his tireless efforts, SSK baseball became recognized as a full-fledged baseball company by the end-of-1970s. SSK Advisory Meetings started in 1975 with SSK inviting over 20 professional players to give their thoughts and opinions to our product development team. Since then, this gathering has been held every year in December and has played a very important role in developing new high quality and innovative SSK baseball products. Our product development team tirelessly continued to invent new products. In 1975, they developed SSK's first aluminum bat with the name "ALL POINT" printed on the sweet spot together with a SSK logo, which allowed batters to make better visual contact with the ball. Ten years later, the "WING FLIGHT" aluminum bat was introduced. The unique tapered shape of its head area and larger sweet spot generated accelerated bat speed and was immediately accepted by high school players, enhancing "SSK's Bat" image. In 1976, the SS baseball shoe line was born. The shoes unique line construction served to strengthen upper sections of the shoe. The SSK trademark was first registered in the USA, Germany, the UK and France in 1978. 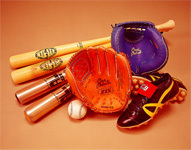 SSK's leather covered hard balls were approved in 1981 by the Japan High School Federation. To obtain an official "Approval" from baseball federations had been one of our dreams since we had started our baseball equipment business. All SSK game balls were approved and have been used in official tournaments at all venues from the Japan Professional League, College, Industry League, High School and Little League.